Thursday November 25th 1897 I got the boys dinner fixed and we got started to town by nine oclock. I did a lot of shopping and we got over home to eat a fine thanksgiving dinner. Did not stay long as it set in to rain. When we got here found the boys had come in from the field. Did the evening work and read some. Friday November 26th 1897 I took up the dining room carpet and got it back down again before dinner. The boys helped set the stove in and Will and I put up the pipe and moved things in the afternoon. It turned very cold. I did up work and read some. Saturday November 27th 1897 I was busy with the kitchen work all forenoon and did a little more of the cleaning after dinner. Will went to town in the afternoon. I read after the work was done in the evening. Sunday November 28th 1897 It was late when we got up and I was busy about the work all afternoon. I was down to Callies & Emmas in the afternoon. I read and wrote in the evening. It is snowing tonight. Monday November 29th 1897 It was very cold this morning. Leonard came down so I got early dinner for the boys and the husked corn in the afternoon. I put up a few curtains. 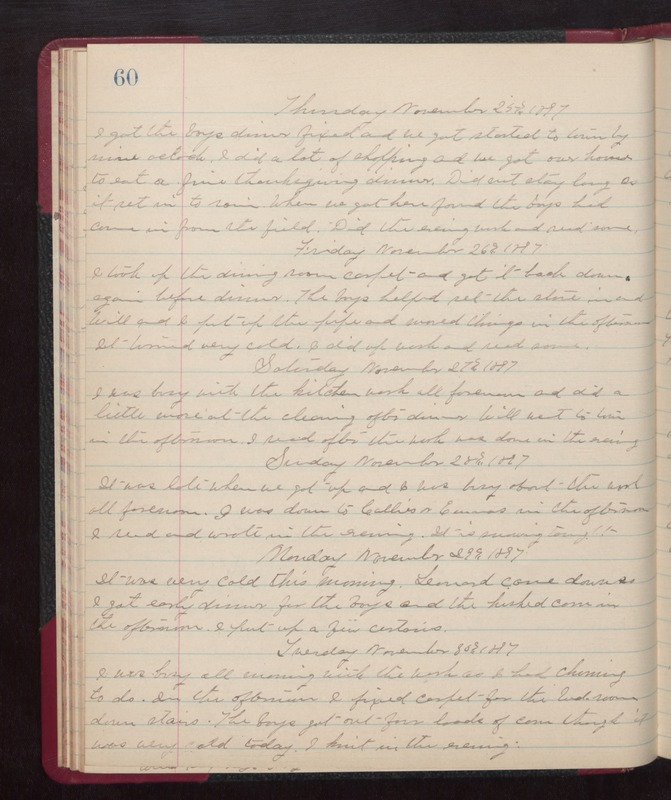 Tuesday November 30th 1897 I was busy all morning with the work so I had churning to do. In the afternoon I fixed carpet for the bed-room down stairs. The boys got out four loads of corn though it was very cold today. I knit in the evening.